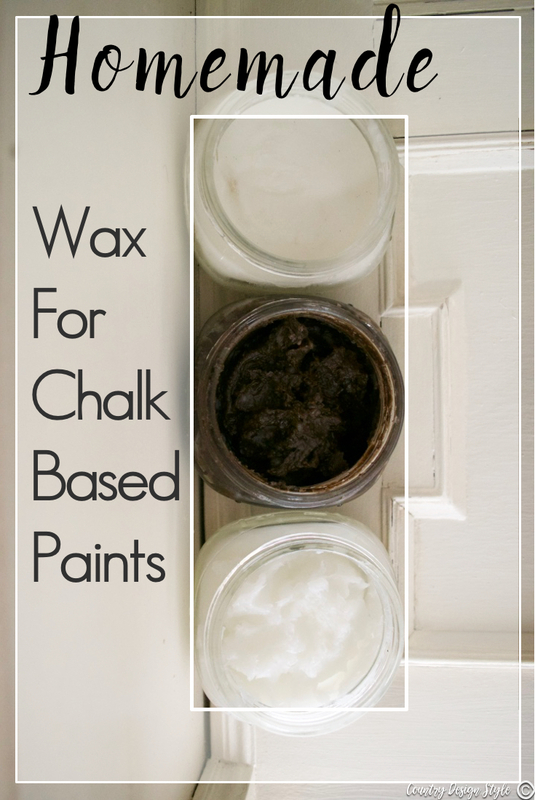 Tired of spending a fortune on wax for chalk-based paints? Me too! 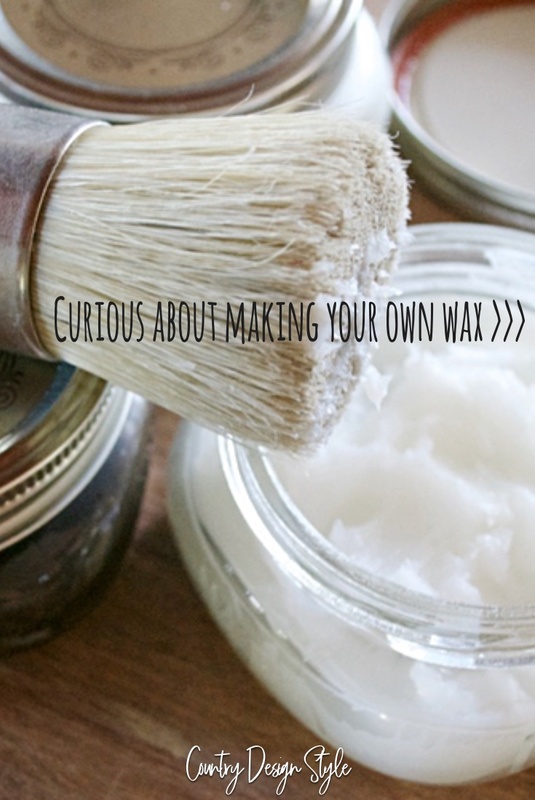 So I make my homemade wax for chalked-based paint that’s cheap to make. 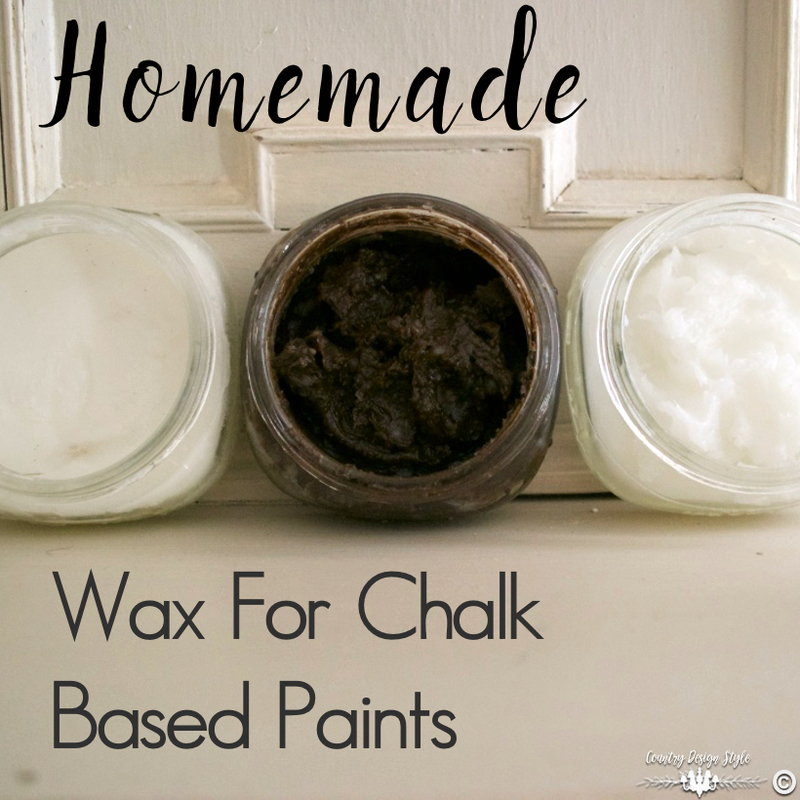 Homemade wax for chalk-based paint recipe is easy as pudding but doesn’t taste as good. 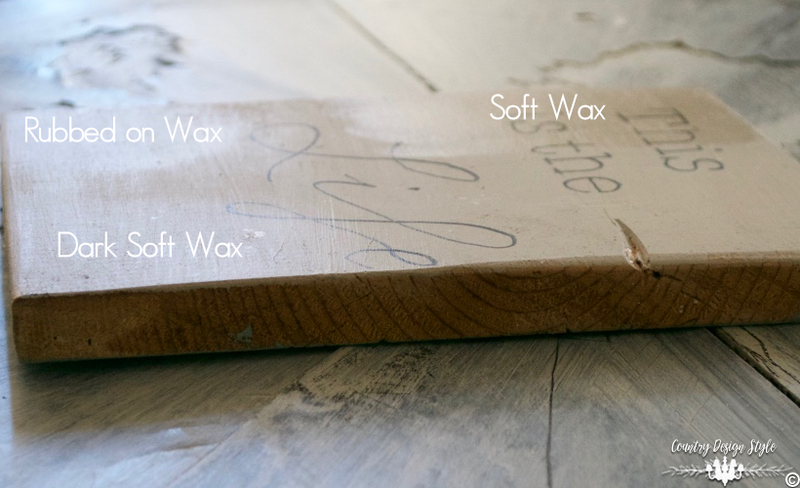 My homemade wax works perfectly with chalk-based paints, stained, or aged wood. I’ve actually “made” my own wax for well over 20 years. I love soft dark wax, but years ago it was hard to find. So I made some by mixing Feed and Wax with a paint tint. I still have a jar of the mix, but it doesn’t smell as good as the ones I make now. I used the wax to create a paint technique I called blurred grain. The technique is in my digital book, Crazy Ulitmate How to Aged Book. 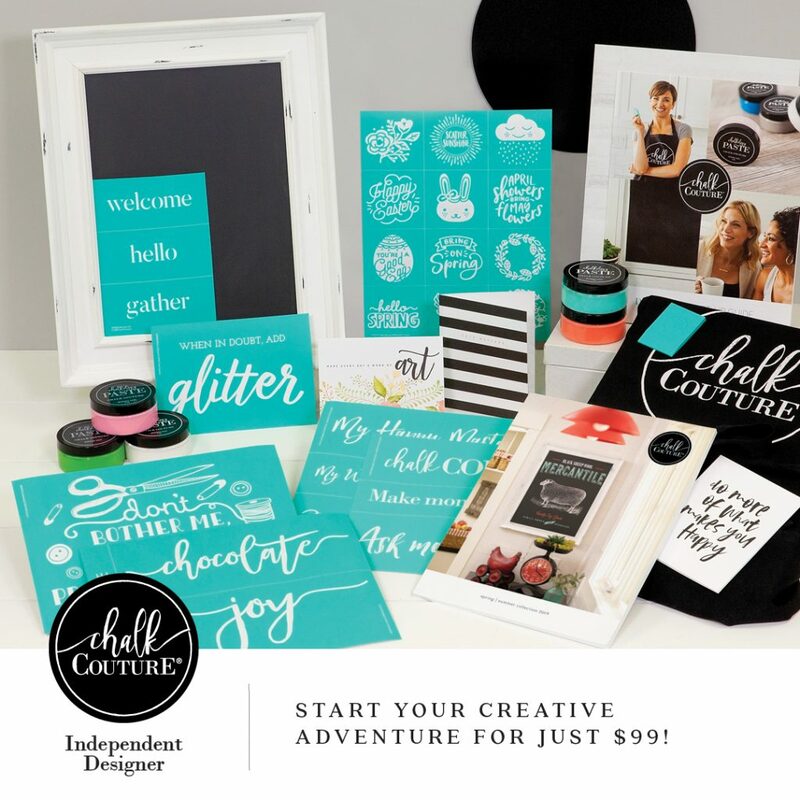 Disclosure: This post contains affiliate links, which means that if you click on one of the product links, I’ll receive a small portion of any sales at no additional cost to you. I only share products I like, used and have ordered, OR the products I want. My next disclosure: This post has been updated to a safer and more comfortable way to melt the wax and add mineral oil. Thank you to my fabulous reader! I made three different types to share today. 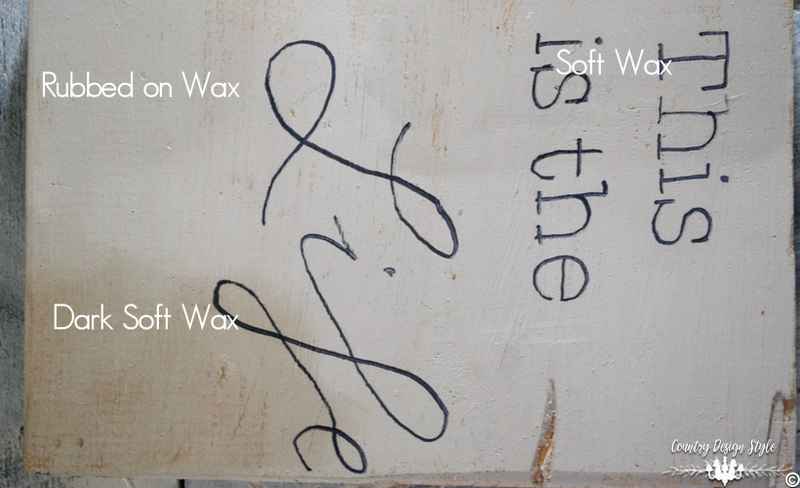 One is a hard clear wax to rub-on, one is a soft clear wax and one is soft dark wax. Colorant tint in raw umber. This is another brand in raw umber. Oh, if you want a brush like the one pictured, this is the one I bought. I like this beeswax because there’s little smell and it melts quickly. 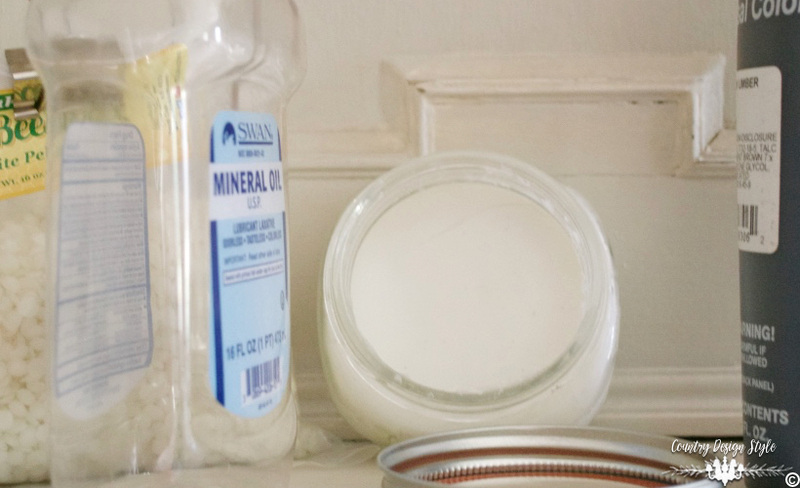 The mineral oil is usually used to oil wood cutting boards. The colorant tint works to add color to water-based and oil paints. I like the darker color of raw umber. It’s not too black, too brown or too rusty orange. I found an old saucepan, whisk and measuring cups in our thrift store that I use for homemade wax and for melting wax for these candles! In the photos below, I used the pan to melt the wax on the lowest flame possible. Now I use the double boiler method. I add water in a saucepan and place an oven-safe bowl on top to make a double boiler. This beeswax is white so it doesn’t add any color to the final wax. Measure 1/4 cup of beeswax in an oven-safe bowl or on top of the double boiler. Add water to the saucepan or bottom of the double boiler. Turn on heat to low-medium heat let the water come to a boil. 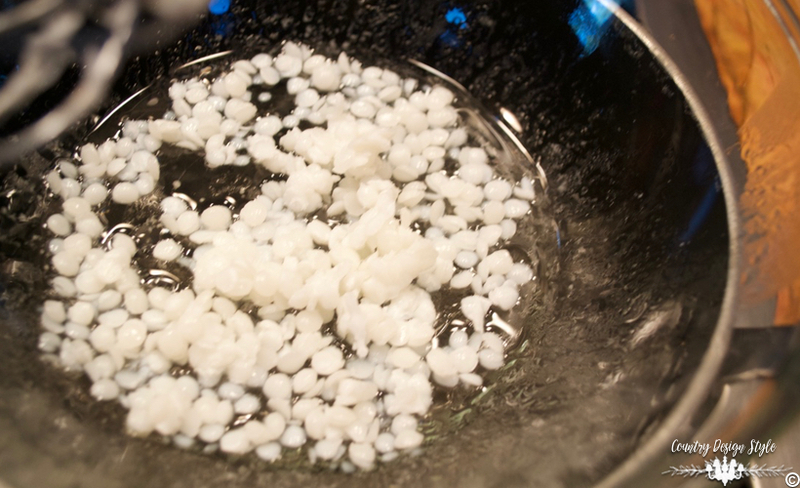 Then place the bowl or on top of the double boiler to melt the wax. This will be quick. In the past, I used beeswax in small squares. I like the beads better. 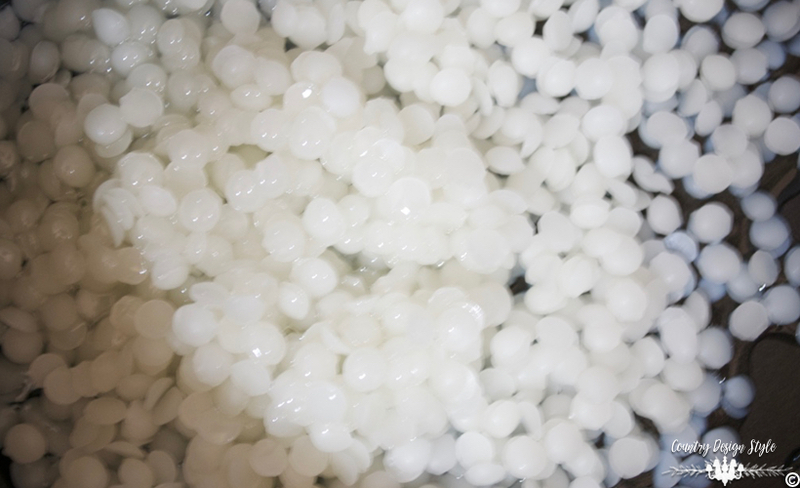 When the wax melts, quickly remove from heat and add 1/2 cup of the mineral oil. 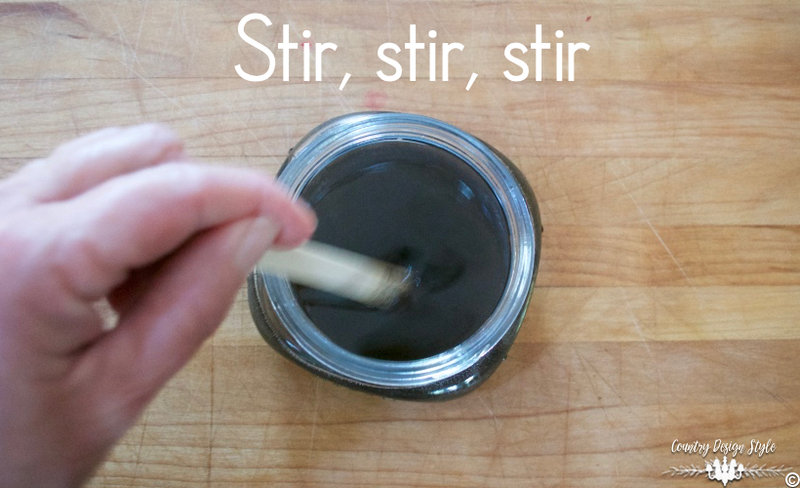 Stir with a whisk. Pour carefully into a mason jar. Mineral oil is not flammable. To be extra safe, simply add the oil to the hot melted wax away from flames. Wax and oil need to be warm to mix well. The oil does start cooling the wax but just keep stirring until mixed well. Let sit open until cool. When completely cool, stir. Then seal. This wax I apply with a wax brush or use a soft lint-free cloth. Measure 1/2 cup beeswax into an oven-safe bowl or on top of the double boiler. 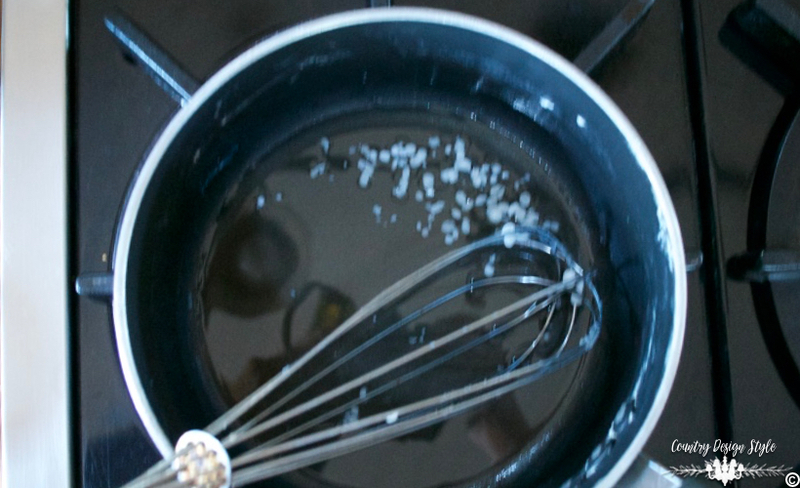 Add water to the saucepan or bottom of the double boiler. Turn on heat to low-medium heat let the water come to a boil. Add the oven-safe bowl or on top of the double boiler and melt the wax over low-medium heat. Remove from heat. Quickly add 1/3 cup mineral oil. Pour carefully into a mason jar. Quickly start stirring. Stir, stir, stir. Let sit open until cool. The extra wax and less oil make a harder wax. This wax I apply with a wax brush. Then buff to a clear shine with a soft lint-free cloth. ‘1. Make the soft clear wax. 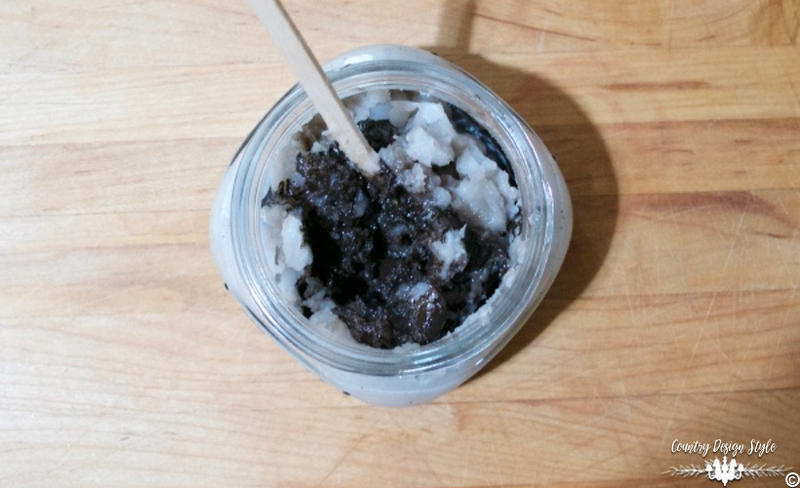 After added the wax into the mason jar, add 1 1/2 to 2 tablespoons of raw umber tint colorant. But just stir and the wax will be fine. I’m still working on my photography skills and will be f~o~r~e~v~e~r! This was the best I can show the different waxes. The clear really doesn’t make much difference on a piece of furniture. Although I believe the harder wax holds up more. But I like applying the softer wax more. You can see on the wood sign where there’s no wax. This photo shows the darker wax in a better light. I’ve also made a whitewash wax for a lighter look or antiquing. There are a couple of other options to melt beeswax. Using one of the scented wax items like the one I have above. It uses a tealight to melt the scented wax and melts these little beads of beeswax just fine. 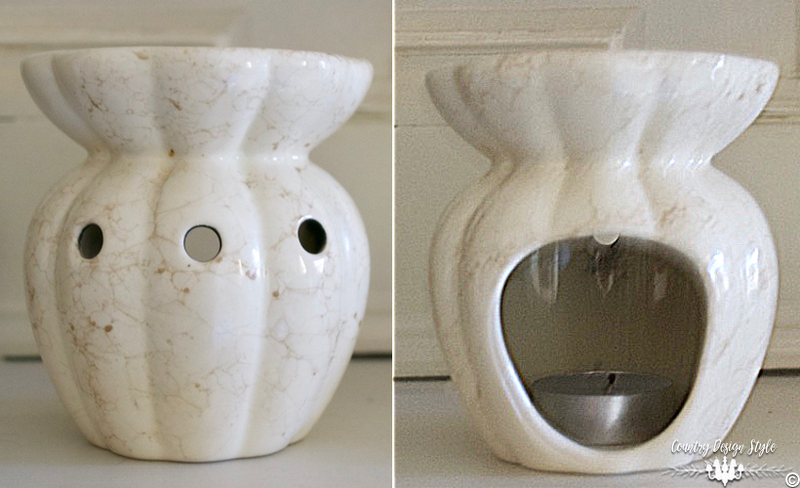 There are also little electric pots that melt scented wax like this one on Amazon that would work. I need to get one!! 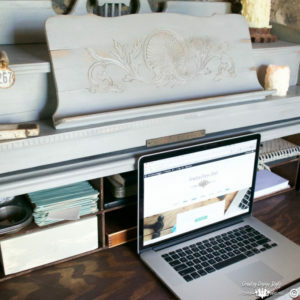 If you need to learn how to protect your painted furniture click here. Here’s a lovely pin to remember where you saw this homemade wax recipe! 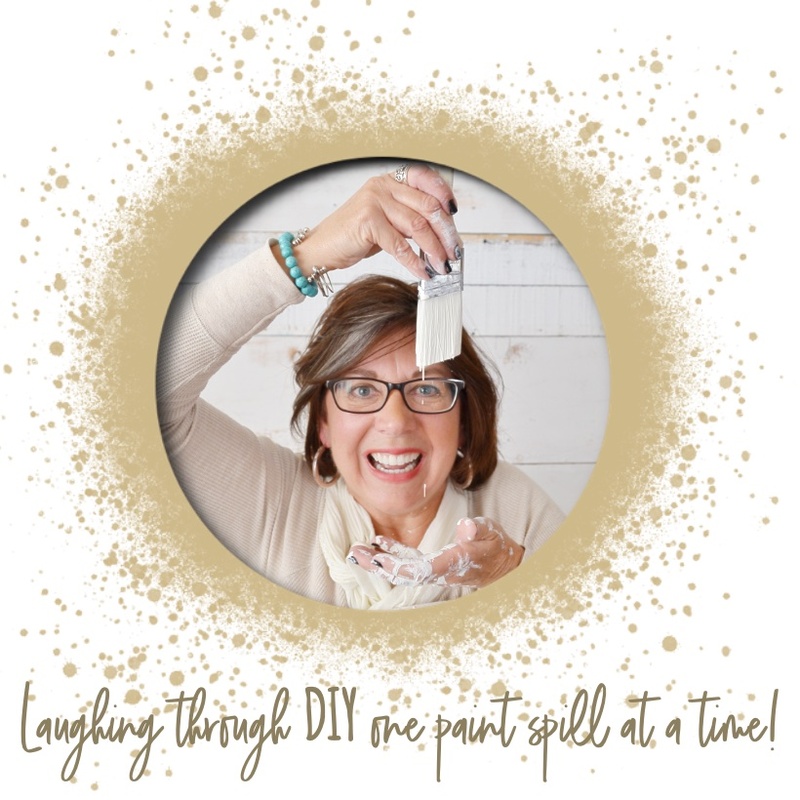 I really like this homemade wax but have to admit, I favorite wax is still Annie Sloan. But I could make gallons of this wax for the cost of one tin of Annie Sloan. 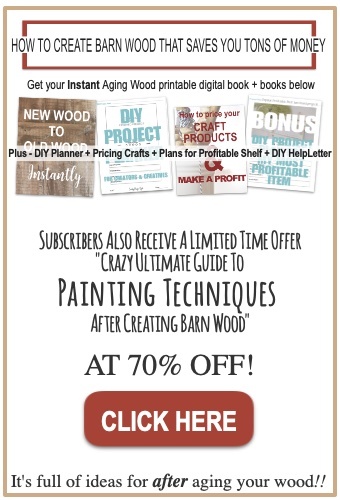 Learn to make homemade barn wood to go with your homemade wax! 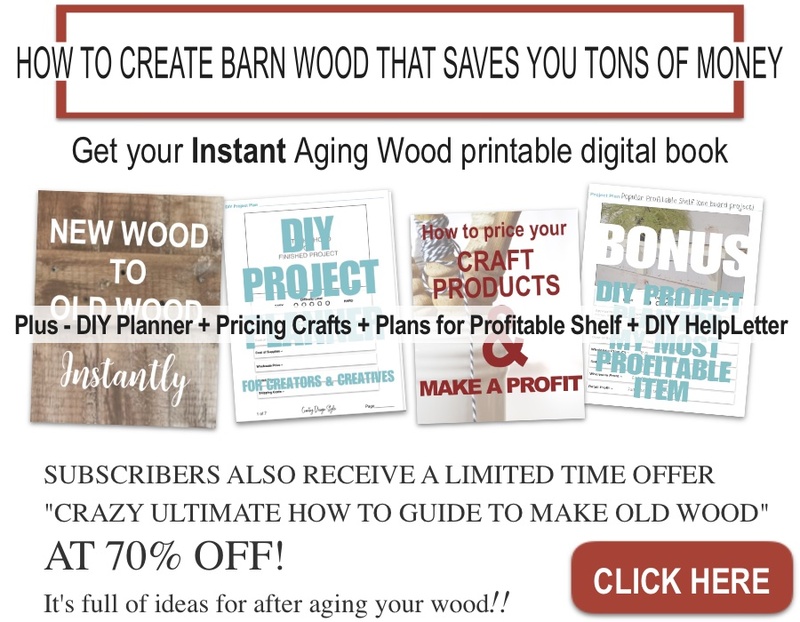 I use homemade wax with my homemade barn wood too! Check the cornerstone post on how to distress wood. Just finished making two batches of soft wax one clear and one tinted dark antiquing glaze. Both came out great. Thanks so much for the great clear directions. Love your blog. I’m glad you made the wax. You will enjoy using it too! 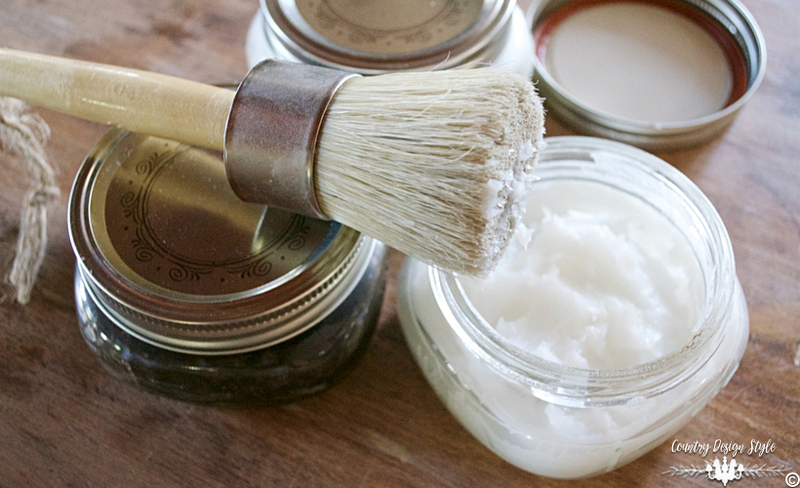 Have you ever tried buffing the dried wax with a shoe shine brush? The old fashioned 2″ x 4″ brish? I tried it on some old wood after I had applied wax with an old wax brush. Worked great at getting in the cracks and crevices without damaging the wood s finish. I was just headed to town to figure out what kin d of wax to buy for some boxes I’m making. Can’t afford AS yet so was looking for other suggestions. You just made my day with this post, thank you! Hey, Teresa! What a great idea to use a shoe shine brush. I bought Mike a fancy new one last Christmas that I’m sure I can’t snag from him but maybe I can use his old one! Can’t wait to give it a try. Thank you for the tip and for following me. Great post! Thanks!! I have a question, can i use paraffin? Hey Damariz! 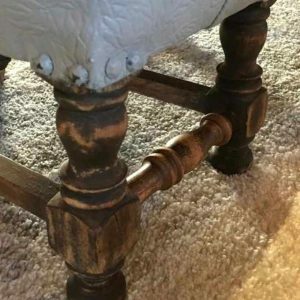 Thanks for the comment on the furniture wax post. I haven’t tried paraffin for furniture wax, only in candy. 🙂 But it should do fine. It will take longer to melt than beeswax. I always tell readers to test on an inexpensive thrift store piece first before applying waxes or paint to expensive or precious items. I used a small crock pot, 1 that is used for heating up Chile cheese dip. I took a pack of tea lights (25) and added them to the crock pot. I remove the tealights from the aluminum casing, broke them in half and removed the wicks ahead of time. Once they were melted I added two thirds of a cup of mineral oil. I let the mixture heat up together in the Crock-Pot on high for 30 minutes, I did very little stirring. I then poured them into two 8 oz Wide Mouth Mason jars. I allowed the mixture to cool overnight, and in the morning I had a very smooth hard wax, and it works great! Ruth, you made me feel so wonderful…I must adjust my crown! 😀 Actually, I love using my homemade wax and saving money too! Thank you for reading and pop back over soon! Thank you, Denise, for the tip! I may try lavender. 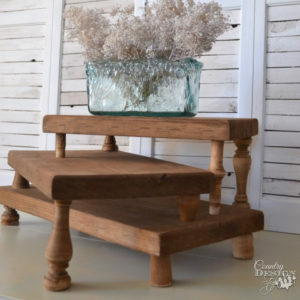 Have you ever used a floor paste wax for furniture? If not, why? I have used Johnson’s floor wax for furniture. I like the softer finish of furniture waxes and that why I use them more. But floor paste waxes hold up to high wear and tear. Thanks for asking. The clear household wax should work. But I haven’t actually tried it. What brand is the household wax? Does it contain beeswax? What exactly do you use as a tint for the wax? Michelle, I added an affiliate link in the post to the tint. Also, you can check your local paint center for paint tints. They work on both oil and water based paints. A little goes a long way. Thank you so much for these homemade wax recipes, Jeanette! 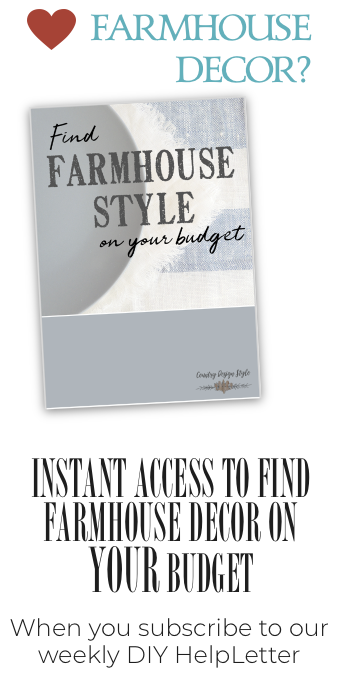 You just saved me loads of $$$ Pinned to share and refer to OFTEN. Love saving money. The only wax I love more than my own homemade wax is AS. But I like the cost of homemade more! Where do you buy the beeswax? Hi, Jacolyn! I buy the beeswax on Amazon. I realize when you get this reply it will be in your email. I don’t want to spam you so if you revisit the post on Homemade wax, you can click the turquoise BEESWAX word and it will take you directly to the beeswax I buy. Some communities will have beeswax in craft stores too. We just don’t have a craft store within 70 miles. Plus I like the small beads of beeswax on Amazon. The wax is very white and melts fast. Thank you for stopping by! Thank you, should you consider selling your own wax? Thanks for stopping by and reading Oana! I thought about selling the wax, but it’s so easy to make, I decided to share the tutorial instead. This is so much fun! Being new to the blog, But not new to DIY, I am enjoying everything I read! It is refreshing to see the instructions and projects that can be completed in a short time. Those finished treasures give us added determination to do some more ? Hi, TK! You are so right! 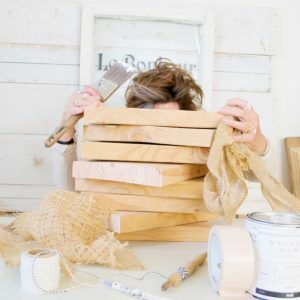 Even as a DIY blogger there are those times when faced with a larger project, it helps to make several quick simple DIY’s to “get in the mood!” Glad to have you on board! Thank you so much for this information. I would love to try and make my own wax as it’s so expensive to buy and I use a ton of it.. Thank you for stopping by. If you make your own wax, please let me know your thoughts on how it works for you. Have a creative day! I love to read all your ideas and wish I was near enough to “play” artist with you . It’s always more fun to work with others and bounce ideas back and forth. 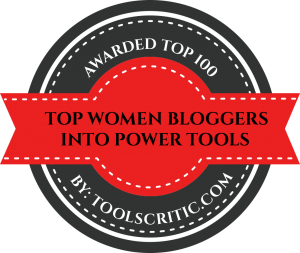 I’m so impressed with your commitment and ability to make projects and show others how to create similar projects on your blog. Please keep up the great work and thank you for the gracious comment. I truly wish you were closer too. There are only one of gal here to create with and she has one of those “real” jobs. I miss bouncing ideas back and forth. I have to tell you when I first read your comment, I flashed back to a CDS Sunday Morning segment about a girl afraid to fry food. She was on a mission to conquer 100 fears. It was so sweet and funny. I should have thought of her when I first wrote the post. Thank goodness for readers like you to help me out. I’m lucky to have you as a reader. If you ever want to bounce around ideas, let me know. Always use a double boiler setup to melt wax . This can be a pot in a pan of simmering water. Wax ( and oil probably also) is very flammable. Your post scared me. Just the thought of the wax catching fire in a pot is disturbing. C.W., Thank you so much for your comment. I rewrote the post to add a double boiler or set up with an oven proof bowl over a pan for water to melt the wax. Plus a couple of other options. If you have a moment, please stop back by and reread the post to see if I got it right. I appreciate each and every reader and especially those that correct me. I’m an old southern gal that learned to cook loads of fried food. But let’s keep everyone safe. Thank you for your help. Great post, Jeanette. I’m going to give this a try. Any suggestions on making a white wax? Maybe adding a bit of white paint to the wax? Tonya, when you have a chance pop back over the read the post again. I included some safer alternatives to melting the wax. Plus I just made white wax this morning to try the safer melt. I will be posting about the white wax next week. But just for you, I added about 2 tablespoons of white chalked based paint to the mix…and it works great. Add it in place of the raw umber tint.